Starting next week, visitors of George Washington's Mount Vernon estate in Virginia will be able to walk away with more than just a figurine of the first president - they'll also be able to purchase his famous rye whiskey. On April 4, the plantation will be serving $95 bottles of whiskey from Washington's reconstructed distillery, which is about three miles down the road from his plantation. A total of 1,100 bottles of the un-aged whiskey will be available. 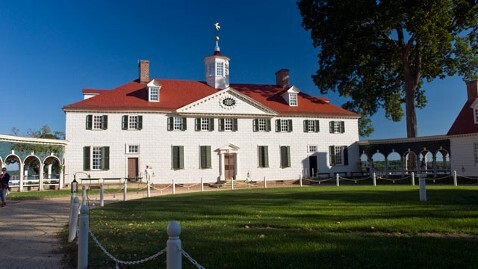 "People like having a tangible connection to the founding fathers, and any way they can connect that through food or drink, it's an exciting element for them," Mount Vernon spokesperson Melissa Wood told ABC news. Wood says this is Mount Vernon's fourth time to reproduce the whiskey, and staffers were able to create Washington's exact recipe through his extensive note keeping, using the same grain and fermentation process as it was done 250 years ago. "We're primarily an educational site, so we hope that our visitors will get a sense of George Washington the entrepreneur," Wood said. "What we know right now is that the distillery was probably the largest in 18 th century America that we know of." "Most people think of him as that man on the dollar bill and hopefully this will shed a new and exciting light on George Washington," Wood said. Washington's Distillery & Gristmill site opens for the season this weekend, and admission is included with the purchase of a Mount Vernon ticket.